Teachers are learners at heart. We’ve got full time jobs, rooms full of hormonally-driven teens, stacks of papers to grade – yet we still find time to write and to learn ourselves. On this episode of Teachers Teaching Teachers, we hear from two inspirational teachers, Donovan Hohn and Alice Barr. Donovan Hohn’s writing has appeared in Harper’s Magazine, The New York Times Magazine, Outside, and The Moby Duck Best Creative Nonfiction, Vol. 2. A former New York City English teacher, he is now the features editor of GQ. He lives in New York with his wife and sons. 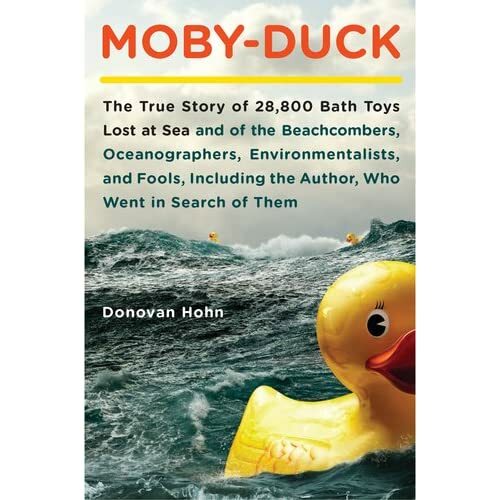 You may have heard his interview with Terry Gross on NPR on March 29, 2011, where he talked about his experiences writing his first book, Moby Duck. Our guests on this episode of Teachers Teaching Teachers suggest our topic, or perhaps it would be better to say, our questions. It seemed to us that a teacher from West Virginia, near last year's Massey Mine Disaster, would have something to say to a teacher from Louisiana who lives not far from the BP Oil Spill. And both of these teachers might have something to say to teachers who live near Tokyo, south of TEPCO's damaged Fukushima Dai-ichi nuclear-power plant. It has been our goal on Teachers Teaching Teachers to understand these crises through the eyes of our colleagues and their students whose lives are most immediately impacted. Thanks to our guests on this episode of Teachers Teaching Teachers, we might better understand how and why it is important to bring these stories to our students. David Pulling, Director of Continuing Education, Louisiana State University, Eunice, Louisiana. David blogs at David Pulling: I Write; Therefore, I AM! and with his students on Voices on the Gulf. He is a member of the National Writing Project of Acadiana. Eric Bossieux, @ericattwit, a "change agent" living in Japan for over 30 years. He has begun writing a blog, Crooked Letters, Straight Lines, on his company's website. Kim Cofino, @mscofino Technology and Learning Coach at Yokohama International School in Japan. Kim blogs at Always Learning. A wiki that Kim started is quakestories. And, Kim's diigo list. April Niemela, ninth grade teacher in Lewiston, Idaho and Co-Director of the Northwest Inland Writing Project. You can also follow @AprilJNiemela. Laura Kriska, writer of The Accidental Office Lady, Laura is an intercultural consultant, and she just started a website, Cherry Blossom Letters "for American kids here to make art and write letters and then send them in packages to Second Harvest, a nonprofit aid organization in Japan. Second Harvest makes daily trips to the impacted region and will deliver our packages directly to people in shelters." The introductions are pretty interesting on their own, but we hope you take the time to listen to the entire conversation! On this episode of Teachers Teaching Teachers, we talk with a couple of teachers in Japan to get a local perspective on the disaster there. The other guests agreed to come on the show in the hallways of the East-West School of International Studies (East-West) in Flushing, Queens, where Paul Allison teaches English. Eric is originally from Louisiana. His father was a pilot with Japan Airlines, so Eric went to international high school in Yokohama and to Sophia University in Tokyo. He does consulting and translation work, and he has done translations for TEPCO (the company that runs the reactor in Fukushima) of their operating manuals for hydroelectric and nuclear power plants. Rounding out this list of guests are two students, seniors from East-West, Martha and Christian. This is the middle of three webcasts/podcasts that we've done so far with teachers (and we hope others) in Japan since the earthquake and tsunami on March 11. Our first conversation took place the week before: Teachers Teaching Teachers #239 - Bringing the crises in Japan into our classes: Dave Mammen, Kim Cofino, and Scott Lo -03.16.11. Last week, on April 6th, we spoke again with Eric Bossieux and Kim Cofino. Look for that conversation in the upcoming TTT #242. We plan to continue to talk about these issues, questions, assessments of the situation, and ways we can help. What can we learn and teach now and in the future about the Great Earthquake and Tsunami of 2011? 3. Support a Digital and Media Literacy (DML) Youth Corps to bring digital and media literacy to under-served communities and special populations via public libraries, museums and other community centers. 8.Engage the entertainment industry’s creative community in an entertainment-education initiative to raise visibility and create shared social norms regarding ethical behaviors in using online social media. Read the white paper, published by the Knight Foundation, online. Watch a video of a roundtable at the Aspen Institute in November (especially 12:10 - 34:45). View a slide show that Renee put together. Renee Hobbs is one of the leading authorities on media literacy education in the United States. She is a Professor at the School of Communications and Theater at Temple University in Philadelphia and holds a joint appointment at the College of Education. She founded the Media Education Lab in the Department of Broadcasting, Telecommunications and Mass Media. She has written dozens of scholarly articles, created multimedia curriculum resources and offered professional development programs on four continents to advance the quality of media literacy education in the United States and around the world. Several leaders in the National Writing Project--Paul Oh, Elyse Eidman-Aadahl, and Troy Hicks--joined us from Washington DC where they were working to lobby members of Congress today, Thursday, March 31. Please add your voice to the chorus of educators from around the country who are blogging in support of the NWP. We’re trying to accumulate 1,000 blog posts by April 8, when the next Continuing Resolution for the federal budget expires. There are already nearly 150 posts - moving stories of the impact of the NWP on the lives of teachers and students - at the archive: http://coopcatalyst.wordpress.com/2011/03/15/the-blog4nwp-archive/ You can tweet or email your blog post URL to Chad Sansing (twitter: @chadsansing; email: csansing@gmail.com) who has been organizing this effort, or post it to this discussion and we’ll make sure it gets added to the archive. Remember to try to tag your posts with: #blog4nwp. FYI, we’ve gotten a few responses on twitter to this effort from the press office of the Department of Education (see: http://www.andrea-zellner.com/archives/629 and http://aetweets.wordpress.com/2011/03/25/blog4nwp-and-being-bossy/), so let’s keep it up! Check out what folks have written to get an idea of what you might add but more importantly take a few minutes to add your story (stories). Listen to find out what we can do to help restore funding to the National Writing Project. Then find your own ways to add your voice the the the chorus singing praises to the National Writing Project!